Free printable baby shower invitations and ideas to help you plan the perfect celebration! The printable templates on this page are a baby boy footprint style. They will print best if you use high quality card stock to print them on. 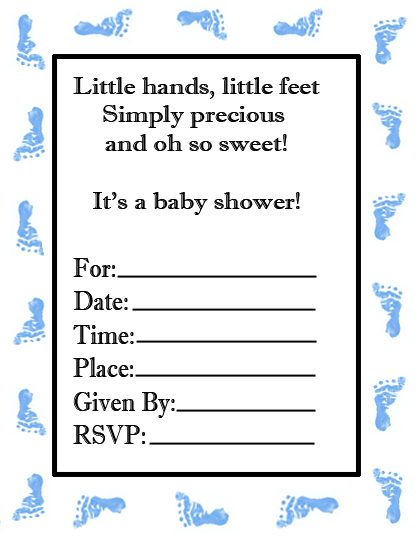 This boy version of the footprint invitation, we have a matching one in pink on our baby shower footprint invitation page. We have included 2 versions of the invitation. One can be filled in with the details of the party. The other is a blank template that you can customize with your own wording. Enjoy! To download the invitation to your computer, simply right click on the image you want to save. Select the option to save it to your computer. From there, either double click on the image and send it to your computer to print or open it in your word processing program to edit. Use thick cardstock to give invitations a high quality look. Customize the look of your invitation by downloading free fonts online to use. Attach a scrapbooking foot charm on top of the card. Add 4 self-adhesive gems to the corners of the card. Mount card on a slightly larger blue card stock. It will give a pretty blue trim around the edges. Use a hole punch and punch 2 holes on the top. Thread black satin ribbon and tie a bow. A sweet baby boy for us to love. Join us for a baby shower in honor of (name). Please Join us for a baby shower honoring (name). A kiss on the nose. It's A Baby Shower! Honoring (mom's name). The (last name) family is growing by two feet! Please join us for a baby shower in honor of (mom and dad's name). Get theme ideas to go with your invitation in our theme section.